If you're involved in the Atlanta residential real estate market in any capacity, buyer, seller, agent or other, you've noticed that something has changed over the last year. The market has shifted significantly. Homes are selling fast, and I mean crazy-fast. What's "crazy-fast?" Days. Sometimes just one day. Sometimes not even a day. Often with multiple offers. I've experienced faster than expected sales recently on both sides of the transaction, on my own listings and when representing buyers. And from speaking with other agents around time, I'm not alone. 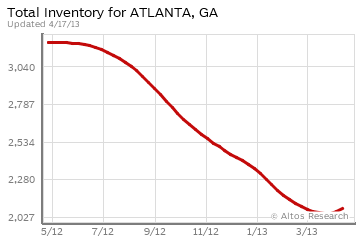 "Sure," you might say, "that's anecdotal evidence, but is it really true for the Atlanta market as a whole?" I looked at the numbers and here's what I found.